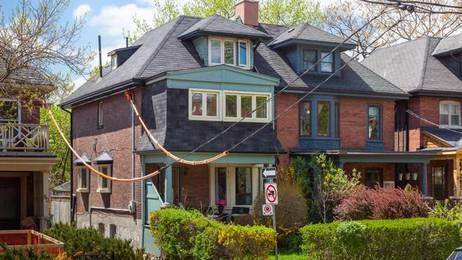 The Action: This semi-detached house was such a popular spot off an up-and-coming stretch of Queen Street in Parkdale that it drew several offers, including one $142,100 over the list price. What They Got: Built over a century ago, this more than 2,700-square-foot house was converted from a duplex into a single-family residence by the sellers with updated mechanics, windows and roof, as well as new hardwood floors throughout, two remodelled bathrooms and a modernized kitchen with stainless steel appliances and a walkout to a new deck, 20-by-80-foot lot and laneway parking. Hidden out of view from the foyer â between the fireside living room and rear dining area â are stairs to two bedrooms and a fireside family room with access into sitting and studying rooms. Two more bedrooms round out the third floor. The basement houses a recreation room and third full bathroom. It had a large second floor because they finished the front porch, so there was an extra room [above]. This propertyâs location was also desirable for different reasons, past and present. Parkdale is becoming super trendy, too, so thereâs a lot of work going on Queen West.